For our videos of these exercises, click the links below to access them on YouTube! PLEASE NOTE: These exercises are suggestions from a licensed and skilled physical therapist and are a sample of typical exercises used in an ACL injury prevention program. Note that this program is not a formal exercise prescription but merely an example of movements to help lower your risk of injury. PERFORM AT YOUR OWN RISK. For a more detailed and patient-specific exercise program, please contact or consult with a physical therapist at Journey Physical Therapy, LLC to set-up an appointment. During improper landing mechanics, knees tend to collapse to the middle in what is called a “valgus” position. A huge contributor to this positioning is weak hip abductor muscles (primarily weak glutes). This exercise is designed to target weak hip abductors to help prevent a collapse into valgus with jumping/landing. *Taking an exercise band, place it around your legs, just above the knees. Keeping tension on the band, take 10 steps to the right, followed by 10 steps to the left. This counts as 1 repetition. *Note that the knees should be in line with the toes and slightly bent. *Perform a total of 3 times for 1 set, 3 times a week to tolerance. 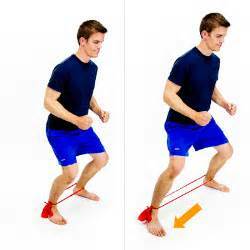 *If exercise is too easy with band above knees, lower band around ankles to increase tension. During jumping and push-off, a large muscle group that contributes to power and force production are the glutes. This exercise targets the glutes and their role as powerful hip extensors during jumping/landing activities. *Lie on your back with your knees bent. If you have one available, place an exercise band around your legs, just above the knees. Keeping your feet shoulder width apart, raise your buttocks off of the floor into a “bridged” position. Be sure not to overextend your back during this motion. Hold this raised position for 3 seconds and slowly return to starting position. Rest and repeat. *Perform 3 sets of 10 repetitions, at least 3 times a week to tolerance. As mentioned in the previous blog post, the hamstrings are the dynamic counterpart to the ACL, they do actively what the ACL does passively to prevent forward movement of the tibia bone on the femur bone, providing good knee joint stability. Because of this important role, appropriate hamstring strength is crucial to maintaining healthy knees and lowering one’s risk of ACL injury. *Lie on your back with feet on a therapy/stability ball, legs straight. Next apply downward pressure through your feet to activate the hamstring muscles. Keeping this downward pressure, bend both knees, rolling the ball towards you. Maintain this downward pressure as you roll back and return to the starting position. If this exercise is new to you, your buttocks should not leave the floor during this exercise. *Note, if this is too easy, when applying downward pressure into the ball, perform a bridge BEFORE performing hamstring curl motion, bringing knees to chest. See image above. If you have any questions about these exercises, ACL injury prevention, or physical therapy services in general, please feel free to contact us at Journey Physical Therapy, LLC. We look forward to speaking with you!